It is no secret that visual content is more engaging to readers. Whether you use infographics, social media images, video content, or just creating ads that are visually attractive, users will always react more to content that is more than just text on a screen. But, just because you are using more visuals in your content and doesn’t mean they automatically work. Aesthetically pleasing content can be a great way to engage users, but you can still lose a huge amount of visitors if your content isn’t compelling and exciting. To help you guarantee your visual ads are truly visually compelling and engaging, Bannersnack recently shared an infographic breaking down everything you need to know about visual ad creation. If you want to guarantee your visual ads are killing it every time, check out the infographic below or at Bannersnack. As smartphone internet use has exploded in the past few years, mobile-friendly pages and search engine optimization have become the standard, but new statistics from Bing suggests the future of SEO may be all about voice search. During the Search Insider Summit last week, Bing representatives told the crowd that a quarter of all searches performed on Bing are voice searches and the trend looks keep increasing for the foreseeable future. Additionally, as users get more accustomed to voice search, it is changing how they are performing searches entirely. Voice searches are notably longer, tending to fall between six and 10 words, compared to just one to three words for text searches. Part of this notable rise of voice search on Bing is likely because the company powers three of the leading voice assistants in the world. 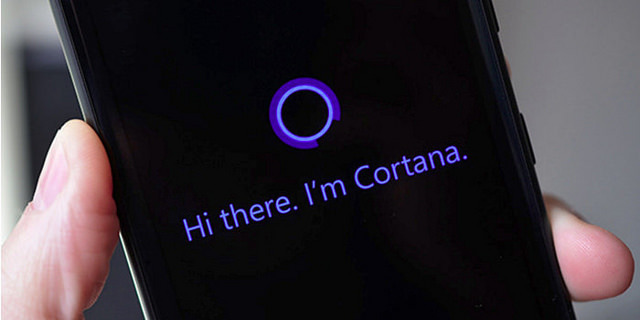 Apple’s Siri, Microsoft’s Cortana, and Amazon’s Alexa are all reliant on Bing to answer voice search queries. However, that shouldn’t discount these findings entirely. While Google hasn’t released any statistics on voice searches performed on their platform, the company has taken clear steps to invest in voice search for future growth – such as using Google’s AI to recognize conversational speech in voice searches by having it read romance novels. Clearly, the two largest search engines recognize that voice search will only become more prominent in the future. Likewise, marketers, SEOs, and businesses should start preparing now by investing in long-tail keywords and voice search optimization. Facebook Video has quickly grown to rival YouTube, so it is unsurprising that video ads have also become a major part of Facebook’s advertising platform. But, as more and more companies share their ads on Facebook, it is becoming significantly more difficult to stand out. 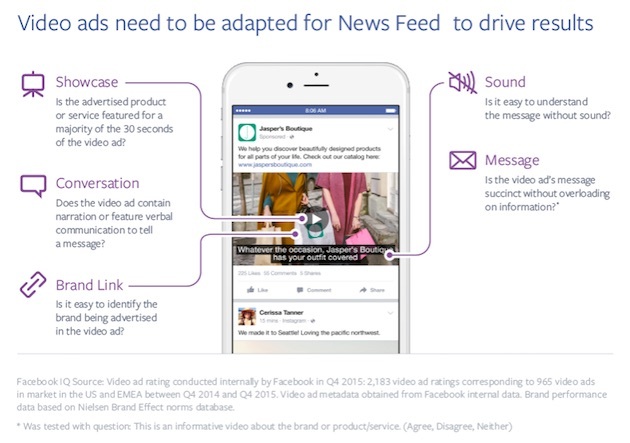 To help companies make the best ads possible for their platform and best engage their audience, Facebook took it upon itself to test out their video ads to see what is best in the eyes of consumers. Facebook showed 965 video ads targeted to the United States and Europe to a panel of consumers in a way that mimicked Facebook News Feed on mobile and asked the participants to evaluate each ad based on four factors: first impressions, branding, messaging, and video features. The majority of marketers aren’t taking how users watch videos into account when they create their ads, according to the report. 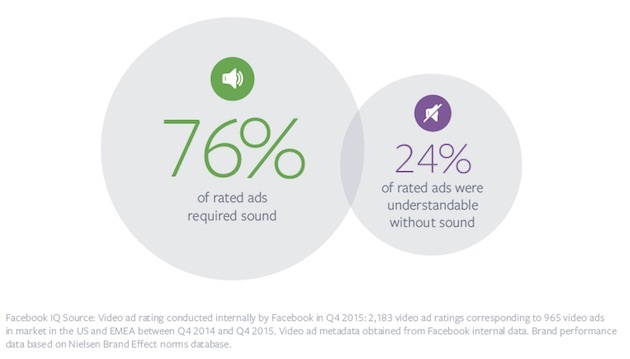 Despite the fact that videos play silently in the News Feed by default and many users watch without sound entirely, only 24% of the ads were comprehensible without ads. Additionally, only 23% of these ads included brand messaging that was easy to understand within the first 10 seconds of video and less than half (46%) featured recognizable brand links. Brands that ensured their ads quickly established their messaging and were understandable without sound were drastically more popular among respondents than those who didn’t. Videos that were intended to create a conversation and succinctly communicated a brands’ message were also more liked by participants in the study. For more insights from Facebook’s study, read the report here. If you own a smartphone, chances are you know the frustration of accidentally tapping on an ad you had no interest in when you were trying to scroll down a page. These accidental taps aren’t just annoying to users, either. Advertisers hate these mobile clicks because they wind up paying for clicks from users who had no intention of converting. Now, Google is stepping in to improve their mobile ad performance and user experience by altering how their ads operate on mobile devices. Of course, Google has been trying to fight back against accidental mobile clicks for a considerable time now, but its recent announcement extends their initiative to its native ad formats. Before, their efforts were limited to just search and display ads. The search giant says they are stepping up their efforts because accidental clicks and taps are bad for everyone. Beyond simply being an inconvenience for advertisers and users, Google says accidental taps also drive down the value of ads. The changes being rolled out to native ads prevents accidental clicks in a few ways. First, Google ignores any clicks that are unusually fast, comparing itself to a professional baseball player having 680 milliseconds to tell whether they should swing at a pitch. Additionally, Google says it will ignore when a user likely accidentally taps on an ad by excluding clicks on the edge of an ad. According to the search engine, clicks on the middle of an ad are associated with “dramatically higher” conservation rates and show much higher intentionality than those on the edge of ads. Social media has undeniably become one of the strongest channels businesses can use to reach out and engage with their audience. But making social media work for you means knowing which platform works best for your business. You might think that all social media sites are essentially the same, but making that mistake can mean squandering marketing and ad budgets trying to connect with an audience that just plain isn’t interested. The truth is every social media platform has a unique audience who interact with each other in ways specifically molded by the site they frequent. Trying to talk to Twitter users the same way you talk to Facebook users will make your message fall flat, while Instagram, Pinterest, and Snapchat users all have their own cultures built from the platform. So which is right for you? It all depends on your business, your values, and who your audience is. The infographic below from Visage will walk you through the basic pros and cons of each of the most popular social media sites, along with some key stats about each social network. Identifying the best social network for you will help you get the most out of your marketing efforts and find the most responsive audience for your brand. A new type of ad has arrived at Snapchat. 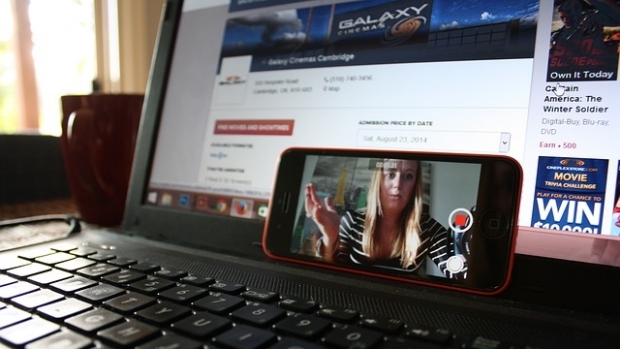 The social imaging platform has recently been diving into monetizing content on its platform. Their latest venture allows retailers to share ‘shoppable ads’ on the app, which allow users to shop for products without ever leaving Snapchat. The ads appeared for the first time recently within Cosmopolitan’s Discover channel. Both Target and Lancome launched shoppable Snapchat ads that run 10 seconds and are shown between Cosmo’s normal article and video content. If users are interested in the products or services shown in these ads, they can swipe up at any time to be taken to an in-app mobile site to purchase the featured products. Just as with normal Snapchat content, shoppable ads are limited to 10 seconds long. Longer ‘snaps’ and ads are likely on the horizon as Snapchat has recently been experimenting with longer video formats. To help drive excitement for the social ad platform, Snapchat also announced that users watch over 10 billion videos every day, with 60 percent of daily active users creating and sharing their own content every day. Advertisers are seeing more value in online video ads than traditional TV advertising, according to the Interactive Advertising Bureaus’ third annual Video Ad Spend study. The annual survey asks 360 marketing and media buying professionals about their past ad spend habits and how they plan to spend their ad budgets in the next year. The takeaway from this year’s findings is that advertisers are moving away from traditional advertising channels in order to reach the more diverse audience online. “Marketers and agencies are telling us they clearly see great value in original digital video programming,” said Anna Bager, svp and general manager of mobile and video at IAB. The majority of advertisers surveyed by IAB (72%) said they plan to move advertising spending away from TV ads in favor of focusing on improving and sharing digital ads in the next year. Out of those advertisers who said they intend to increase their digital video spending, 41% said they plan to pull from cable TV advertising. Similarly, 47% of these advertisers plan to pull from broadcast TB spending. Some advertisers said they would also pull from non-video ads online (30%), advanced-interactive TV (30%), and mobile video ads (28%). Most tellingly, more than two-thirds of advertisers and marketers (68%) said they believe original digital video will be as, if not more, important than, original TV programming within three to five years. The study also found that advertisers and media buyers have increased their overall investments in digital video by more than 114 percent over the past two years, averaging more than $10 million annually spent on digital video. 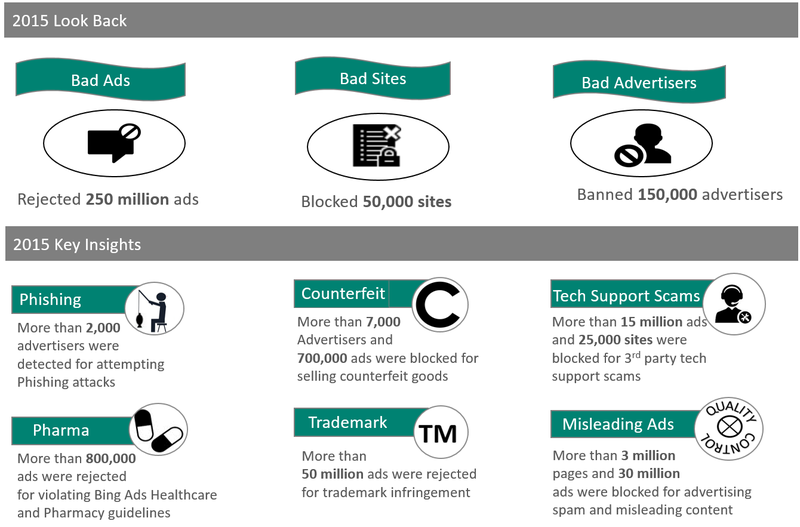 Every year Bing likes to highlight its efforts to keep the web safe with its “Bad Ads Report” and this year shows that the endless war against online scammers and hackers has remained largely consistent recently. Despite constant efforts to derail the malicious actors on their platform, tech support scams and purposely misleading ads remain the biggest problems on Bing Ads. The company blocked over 15 million ads for running tech support scams alone. Overall, Bing says it has rejected over 250 million ads in the past year, as well as blocking 50,000 sites, and banning 150,000 ads for breaking their guidelines. Considering Bing’s trademark usage policies are relatively loose compared to competitors like Google, it comes as a surprise that the company says it dismissed more than 50 million ads in 2015 for trademark infringements. The rest of the report is less surprising. Phishing attacks remain a relatively minor issue, and pharma and counterfeit goods are still being delisted by the hundreds of thousands. Find out more from Bing’s ad report here.